Another little Korean Food adventure in the heart of the Korean community. Upon arrival, Hamgipak was almost packed with many customers in deep conversation but my friend and I managed the last free table before being given the rather cute, colourfully decorated menus to have a browse through as soon as we were seated. This restaurant has long tables which are ideal if you are coming to dine in a large group but also smaller tables for two in the far left hand corner. Our orders came incredibly quick. Less than 30 mins of waiting. All the starters and shared main dishes arrived one after the other. 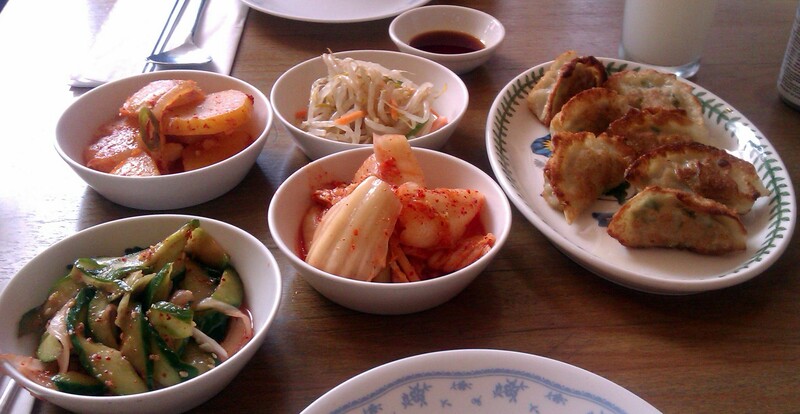 Loved the Banchan, especially the potatoes, spicy shredded cucumber and beansprouts. These were similar starters I was offered when I went to Ha Ru a few months ago. 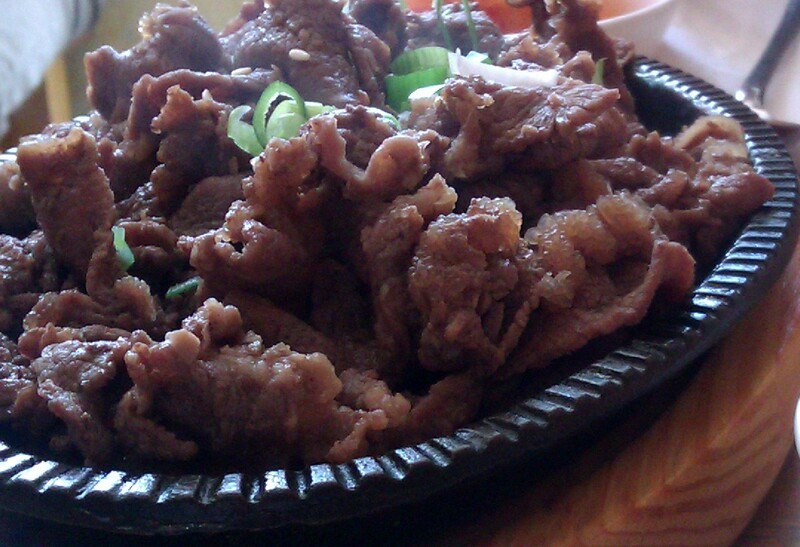 Despite not having as much marinade, the Bulgogi was still tasty and tender. My friend and I shared a bowl of rice which complimented the beef flavour. The fried pancake was our first try and it had a small filling – onions and a few green beans. 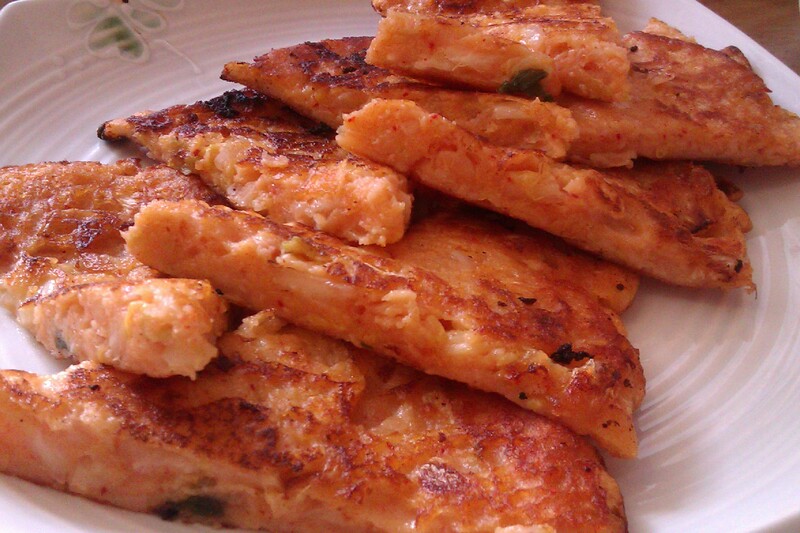 The Kimchi flavour within wasn’t overwhelming but you could taste a bit of its saltiness as you chewed (if you want to try a Korean style pancake perhaps opt for the seafood one). The fried pork dumplings were wonderfully crispy and chewable as soon as we bit into them, as well as lightly meaty and mixed with a few chopped vegetables in the middle. The menu itself had the usual favourites such as Bibimbab, Bulgogi and other BBQ style meat dishes that came on a hot plate. There is a lunch menu that has a lot of focus on broth or soup-based food in a hot bowl so if you fancy soup and want to get it at a reasonable price take a look a Hamgipak‘s lunch menu that lasts from 12 – 4pm. Overall: Pretty good for a quick lunch meal in a small, buzzing restaurant. The portions were generous and the price reflected on it (we even managed to clear the plates in an hour of relaxed eating). Bulgogi was the priciest dish but if you wanted an immediate taste of sizzling BBQ beef served on a hot plate and don’t mind paying for a slightly high amount then go for it. Fast, immediate service from the only waitress working during that hour and she even came by to ask us how our food was, during the rush hour.